For information on Dash and Albert products, visit or call one of our Texas Showrooms. 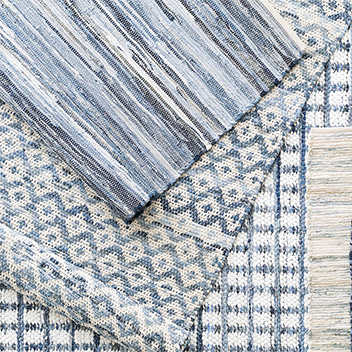 Annie Selke has made high-quality Dash & Albert rugs available for nearly 25 years. From sensational stripes and versatile vintage prints to poignant patterns and savvy solids, they’ve got something to make your space eye-catching and stylish. Looking for an area rug to put in high-traffic spaces and mud-frequented zones? You’ll want to check out their ever-popular indoor/outdoor rugs. Made of super-heroic polypropylene, they’re easily “scrubbable”, bleachable, and UV-treated to prevent fading. Now that’s what we call easy on the eyes and wallet since these rugs are going to last!